We here at LupRocks.com are celebrating our one year anniversary! We want to celebrate with you, our dear members (and avid readers of this blog), have contributed greatly to our success. Okay, so on the count of three everyone pop a champagne bottle. Ready?! 1...2...3...oh well, the thought was nice. I guess, synchronizing excitement can only be done in a sports stadium, and to be honest, doing the wave is kind of lame. So celebrate with us instead by taking our survey. In our effort to continually improve the website (and in celebration of our first year anniversary!) we’ve developed a survey so that we may get some feedback from the designers who we are here to serve! Please take a few moments to fill out this survey; your input is instrumental in keeping LupRocks rocking! As an added incentive, everyone who fills out the survey will be eligible to win a free, one year Siren level featured listing (value of $1,095). We thank you all for being a member of LupRocks.com, and we thank you in advance for participating. It is because of the talent and creativity of the designers that we work with that LupRocks.com has been so successful! It follows, that if you have a reality TV show, you have addicts that will tune in. This is dedication! Tyra Banks is synonymous with model. So we love seeing the expert herself modeling some of our favorite jewelry designers. Amali Jewelry and Judith Bright have benefited first hand form the runway queen’s modeling experience. These two LupRocks.com designers have had reoccurring appearances on the hit show. Congrats! Way to strut your stuff! Let’s face it, you work your tush off coming up with a concept, you pour your sweat and tears into it, and after days, months, years of waiting you finally get a result. The problem is that by the time the world is ready to wish you congrats, you are too humbled to brag about it. Working with editors, costume designers, and jewelry and accessory designers, we understand that it may be hard for you to gloat the fruits of your own labor, but we love gossip, (no seriously, we’re addicts) so we will do it for you. Therefore, we are excited to dedicate today to paying homage to our beloved LupRocks members who have recently told us about their successful placements. We encourage everyone to let us know about successful placements and coverage. Congrats everyone!! First up, punk rockette Avril Lavigne was spotted wearing this Tweety Fine Jewelry pendent on the beach scene in Miami. Tweety Fine Jewelry offers fun and fresh jewelry from everyone’s favorite yellow feathered fashion icon. Next, YRB magazine pulled two pieces from designer Judith Bright, a big chunky bracelet and a big chunky ring. 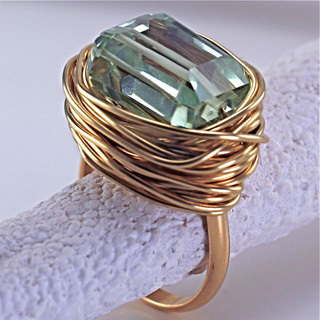 Judith Bright’s jewelry offers a clean aesthetic that fits perfectly with the fun fashion trends of today. We are looking forward to sharing in the happiness that comes with your successful exposure. Let us know, and we may just brag about it on your behalf.